All transactions are safe and secure with a reliable history in online purchasing behind each of our associates. Buy the Pandora Blueskins Na'vi t-shirt to own Avatar clothing and merchandise. Neytiri is not only a Na'vi, she is the princess of the Omaticaya Clan and a former Pandora Blueskins cheerleader. 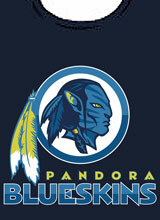 Support her favorite team, the Pandora Blueskins, who had to stop their season to protect their Hometree. Under the Na'vi Hometrees is where the mineral unobtainium resides, which the RDA wants to mine. Despite the turmoil, Neytiri's love helps to transform one of the intruders, Jake Sully, from military man to heartfelt Na'vi (aka Pandora Blueskin). Pair this Pandora Blueskin design with a Navi Avatar Neytiri shirt or an Avatar costume, video game or action figure. In addition to the Pandora Blueskins Na'vi tee above, browse the Avatar Clothing Gallery for more apparel like men's and women's clothes, kids shirts or hoodies.